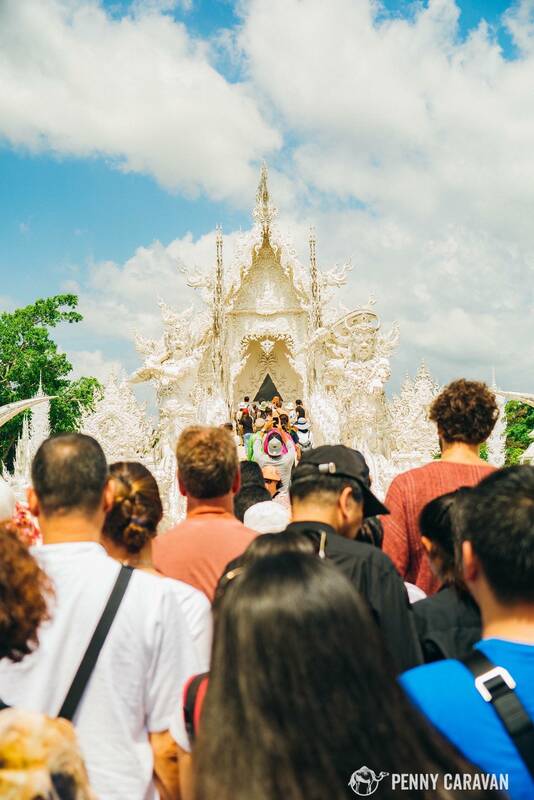 If you’ve scanned Instagram or Pinterest lately, you’ve probably seen photos of the Thai temple that looks like the entrance to heaven, completely white from top to bottom. 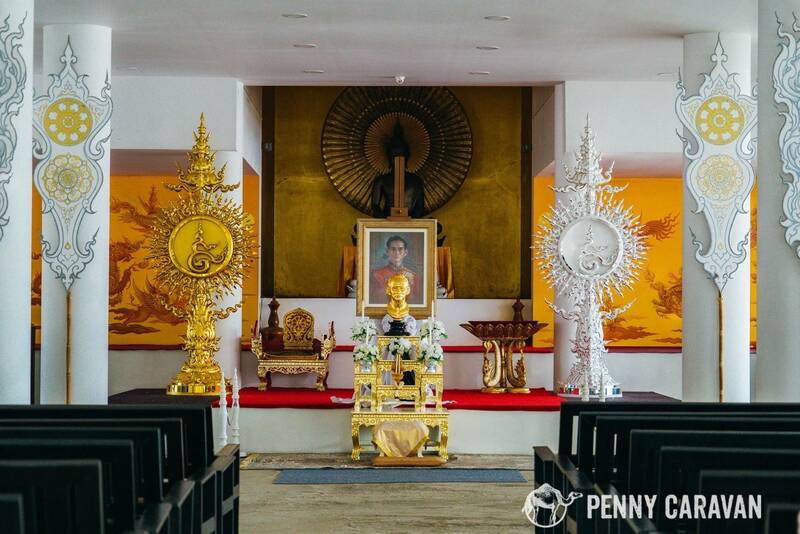 But there’s something odd about this temple that doesn’t at all come through over the internet, and it just keeps getting weirder the closer you get. Not only is it completely white, it is trimmed in mirrors so it literally shines in the sunlight. First of all, it’s not really a temple. 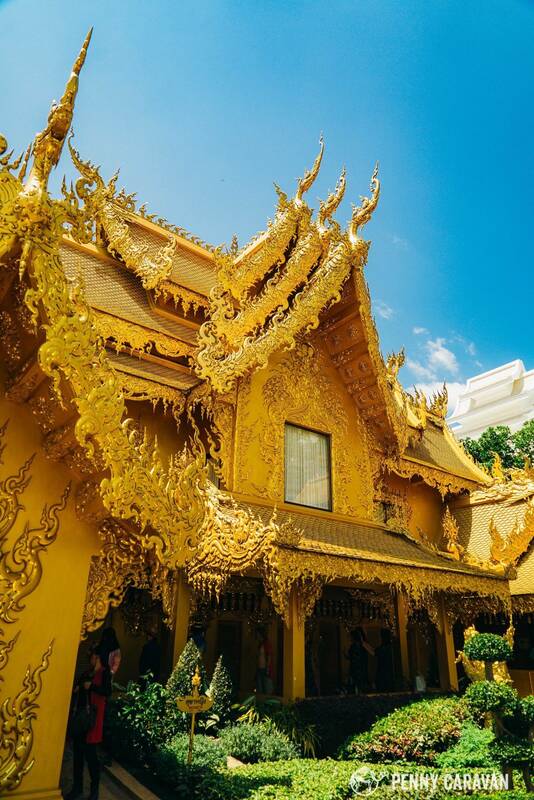 The original temple that stood on this location was in such a state of disrepair that local artist Chalermchai Kositpipat purchased the property and built an entirely new temple, more as an art installation, to be a source of learning and meditation. He began in 1997 and the work is still ongoing to this day. He is frequently seen around the complex and loves to meet people, so don’t be shy and say hello! 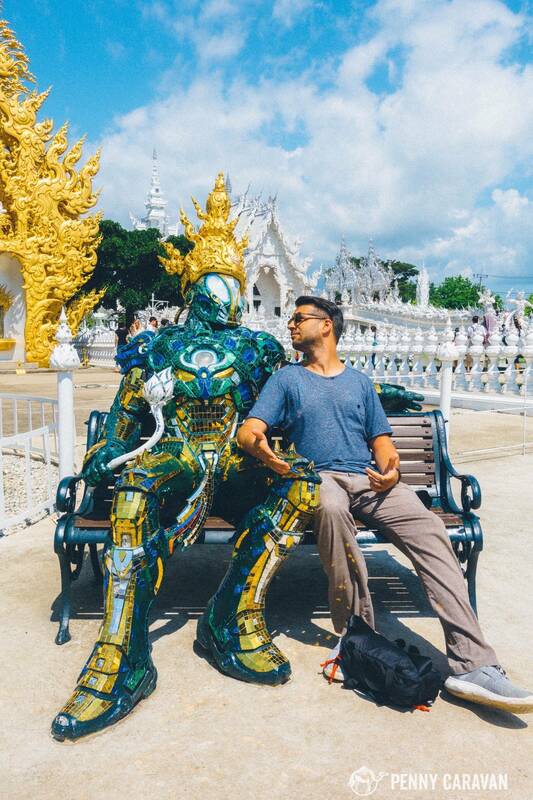 Before you even enter the gates, you’ll meet this Iron Man/Transformer—your first clue that this is not a traditional temple. Part of the entrance, a miniature version of what’s to come. Plenty of spots to take picturesque photos of this very unique temple. 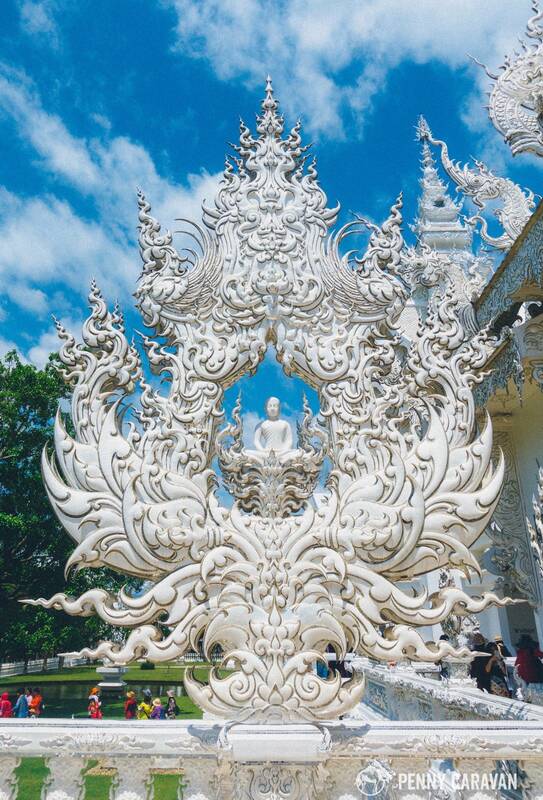 The architecture is very symbolic, each structure an allegory to traditional Buddhist teachings. Obviously the white symbolizes the purity of Buddha, with the mirrored trim offering visitors a chance of self-reflection. 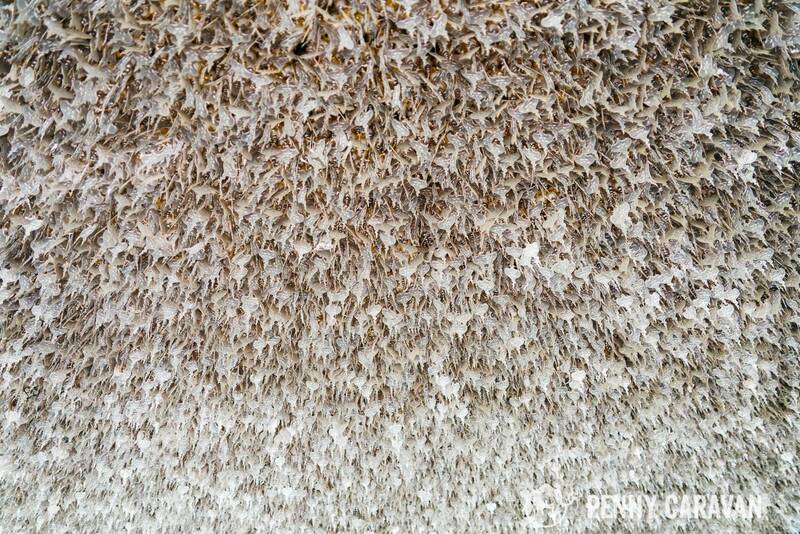 But a close look at all the details begins to reveal some disturbing and curious images. 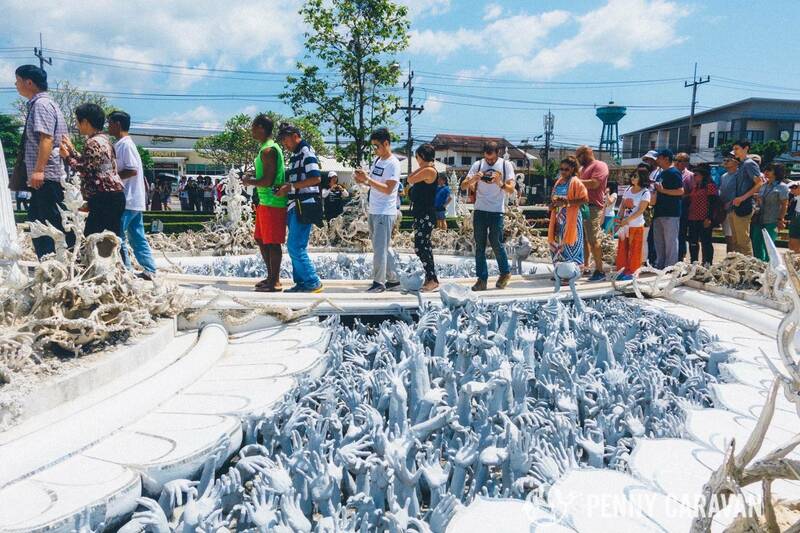 In front of the bridge is a sea of hands reaching skyward, symbolizing human suffering. Crossing the bridge means overcoming worldly temptations and desires to complete the cycle of rebirth and reach the gates of Heaven. 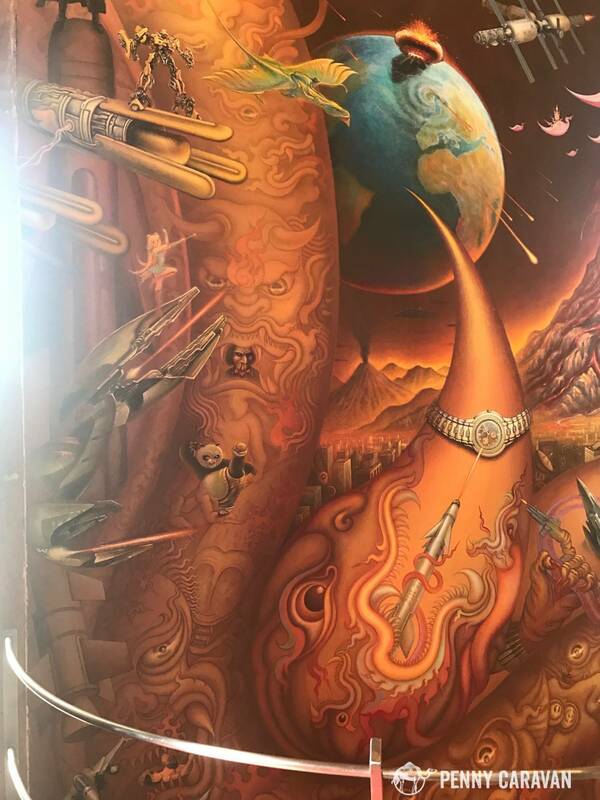 Once you finally enter the temple, you get to the strangest part yet—elaborate murals depicting an apocalyptic scene with appearances of current events such as the burning 9/11 twin towers, and pop culture icons including Hello Kitty and Angry Birds. 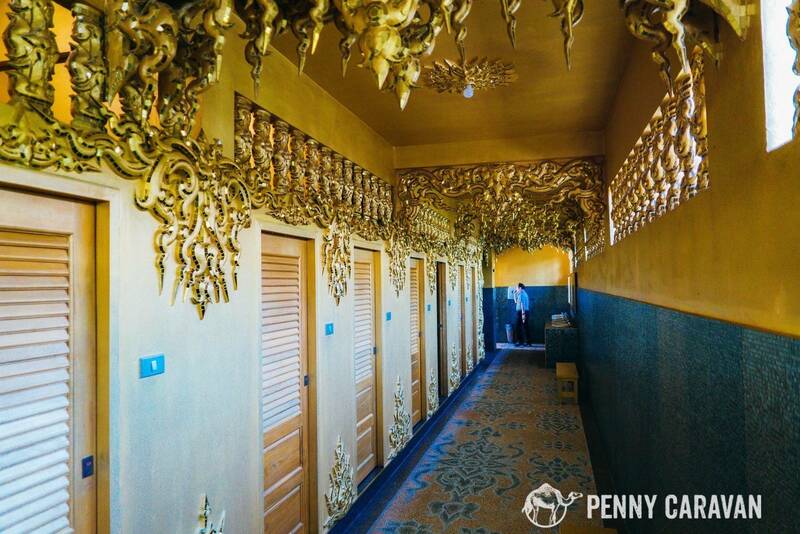 It’s the last thing you’d expect to see inside a Buddhist Temple, and as photos are not allowed inside, it’s a secret that the Internet doesn’t often show you. But I managed to sneak a few with my phone anyway—shhhh, don’t tell. 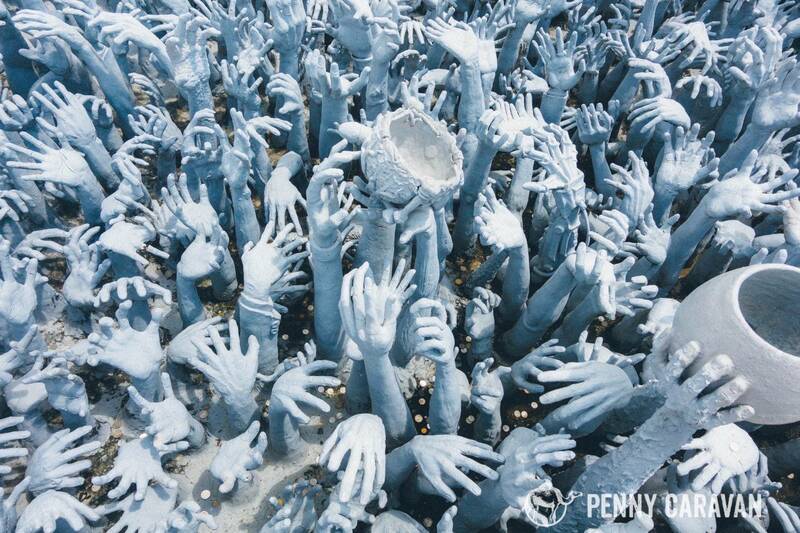 The lake of suffering is a little frightening as hundreds of hands reach out to you. The Kinnaree are creatures from Buddhist mythology. Intricate details on the building façade. 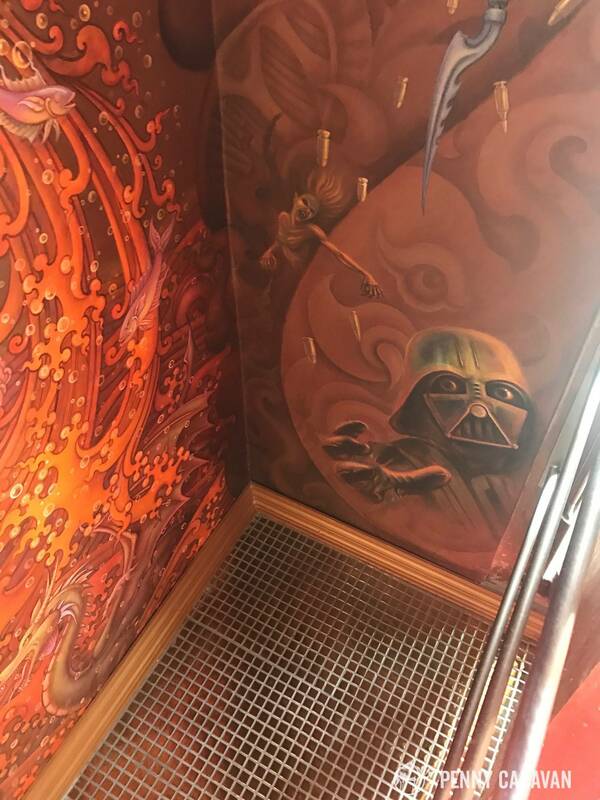 The temple interior is painted like this, with dozens of surprise appearances of your favorite pop icons. 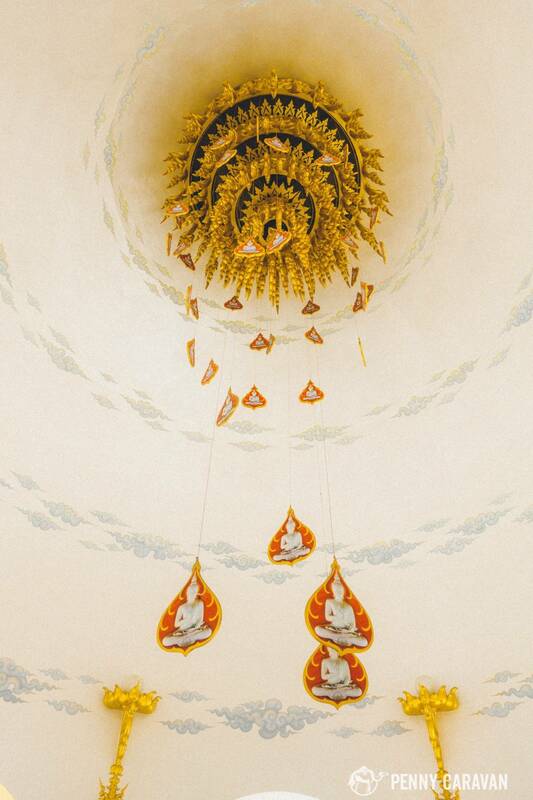 Visual delights adorn every corner of the temple complex. Continuing around the complex, you’ll find other buildings, beautiful fountains, and huge trees with thousands of hanging tin “prayer plates”. 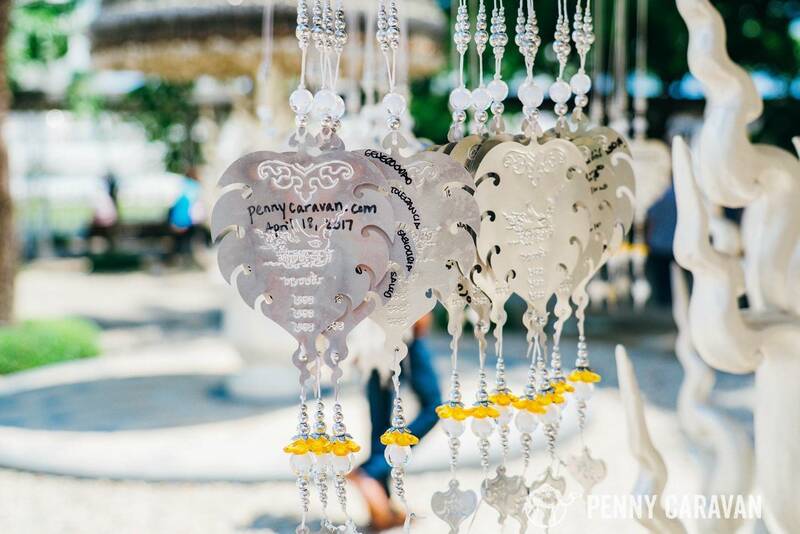 You can be a part of the art installation of Wat Rong Khun by purchasing a prayer plate to add to the trees as contribution! And while you’re there, you absolutely must visit the restroom, whether you have to go or not! You won’t be able to miss it; it’s the only building clad in gold, which represents human greed and what the artist thinks we should do with those desires (flush them down the toilet). 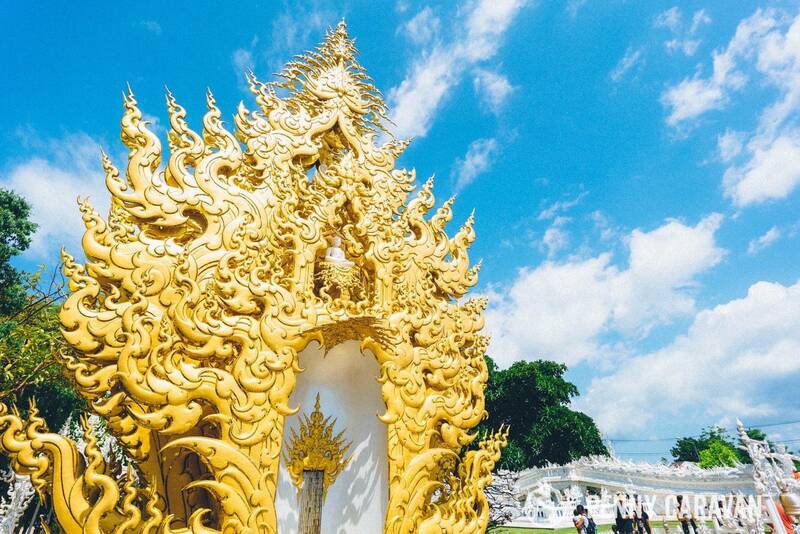 An area for mourning King Bhumibol. 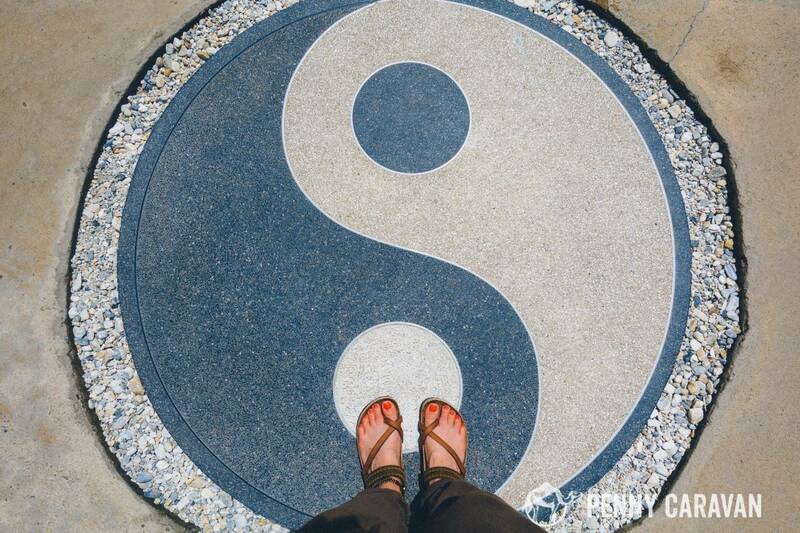 The concept of yin and yang is very important in Buddhism. Beautiful dome above a fountain. Literally thousands of these pendants. 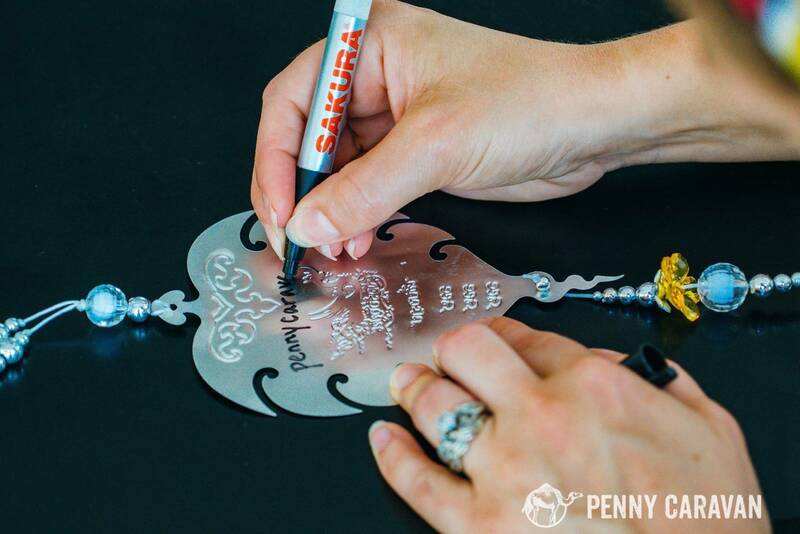 Writing our name on a pendant. The fanciest restroom you will ever use! 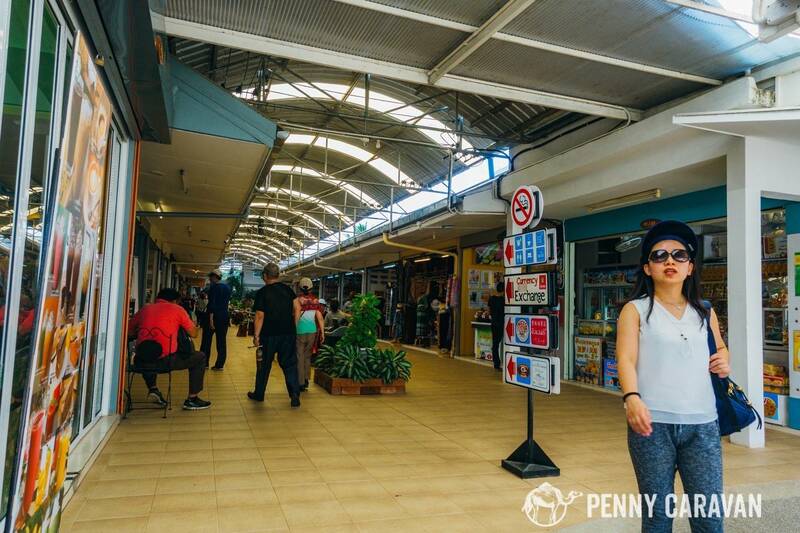 Exiting the temple grounds, you are funneled out to the shops that inevitably pop up around any tourist attraction. Don’t miss the free (and air-conditioned!) museum that showcases more of Chalermchai Kositpipat’s artwork, including his famous pieces of King Bhumibol. There is an official gift shop where you can purchase prints of the art, and a free station to get your passport stamped as a memento of your visit. You can make an afternoon of your visit by having lunch at one of the restaurants or at least cooling down with a fantastic iced coffee. 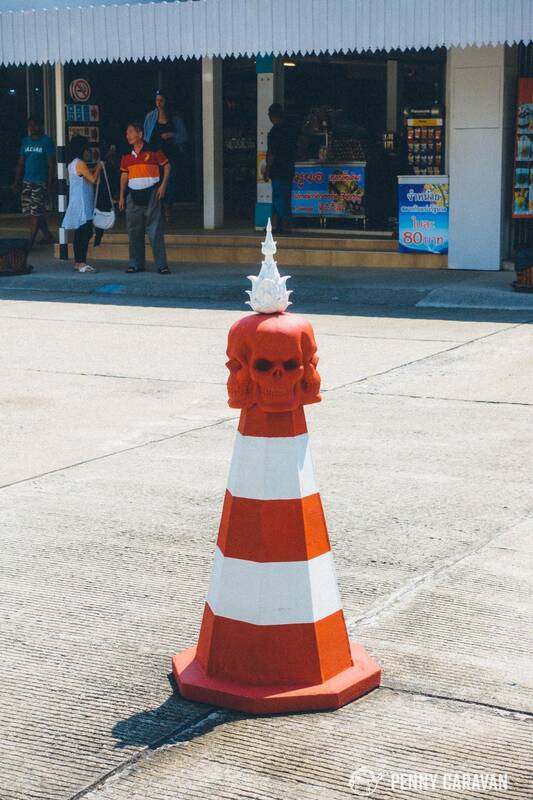 Everything here is a piece of art, even the parking cones. Nearby are plenty of shops, restaurants, a museum and art gallery, and plenty of places to get an iced coffee to beat the heat! 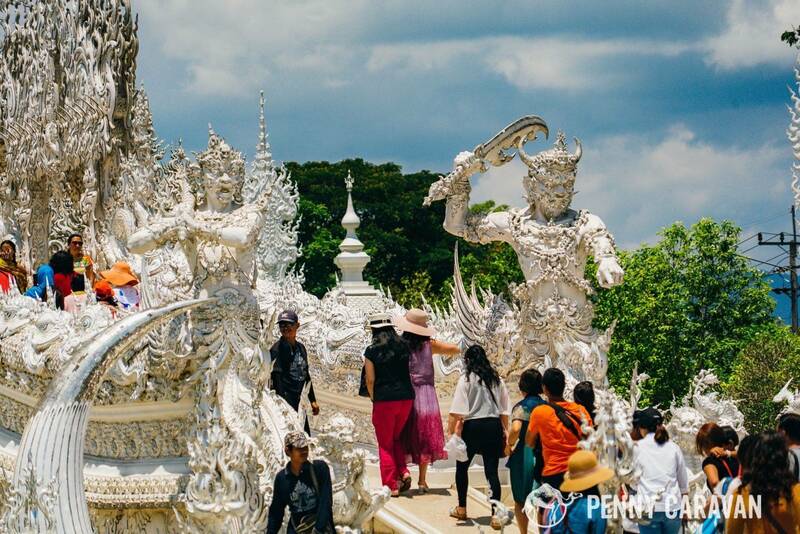 The White Temple is one of the most visited tourist attractions in all of Thailand, and tour buses throng to this place at about 10am every single day. Try to get there either very early or later in the day to avoid maddening crowds, and perhaps complete your tour through the temple once for the experience, and then go through a second time for photos. We found that the crowds died down quite a bit our second time around, and we were able to get much better photos when we weren’t shoulder-to-shoulder trying to get over the bridge. I can’t help but think the artist created the funneling pathway through the complex intentionally, to make you feel like cattle being herded. 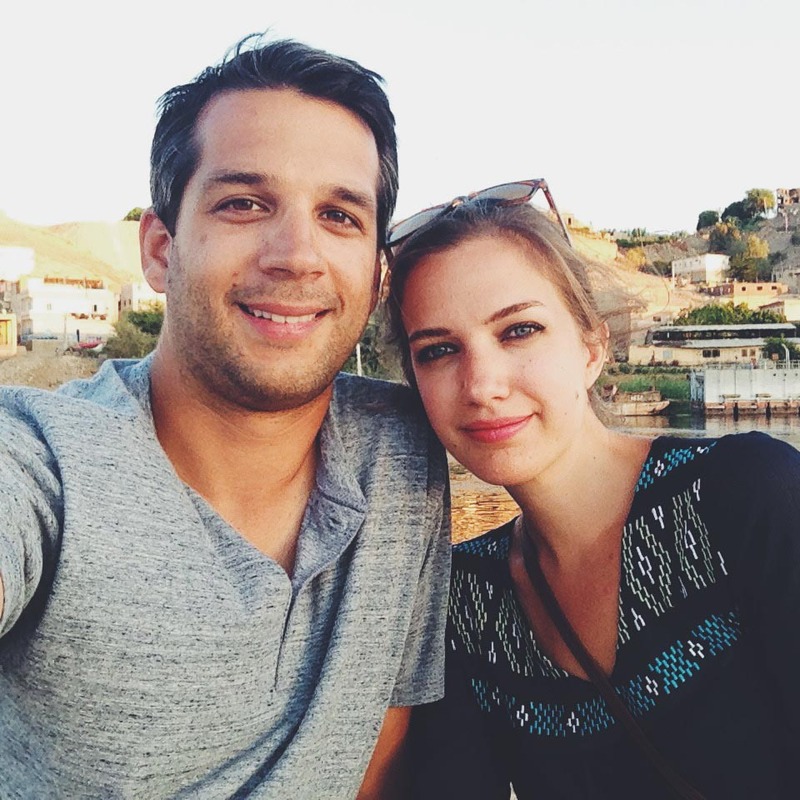 On the tiny bridge that crosses the lake of suffering, I nearly felt claustrophobic as I was literally shoulder-to-shoulder in a crowd of humans, pushing and shoving to get in front of each other, while even from beneath us hands reached out toward us. It certainly added to the experience! If you suffer from anxiety, you may wait a few minutes until the crowd clears before you attempt to cross. The line to cross the bridge. At one point, the bridge was insanely crowded to the point of claustrophobia. 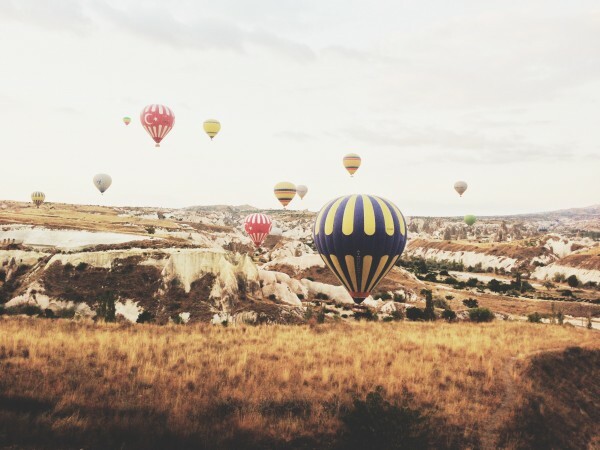 If you’re not on a tour group, you’ll need to arrange your own travel. The best way is by taxi or tuk tuk. 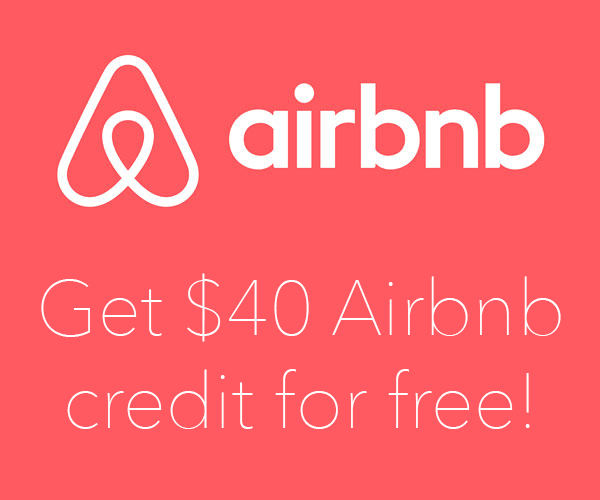 A round trip from the city center should cost around 300 baht. 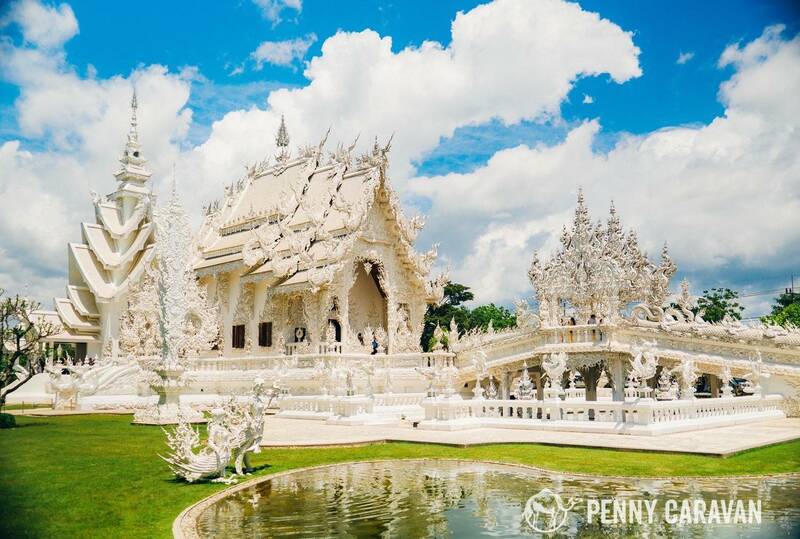 You may try to find a driver to take you to both the White Temple and the Black House, which is on the other side of Chiang Rai and negotiate a better rate. 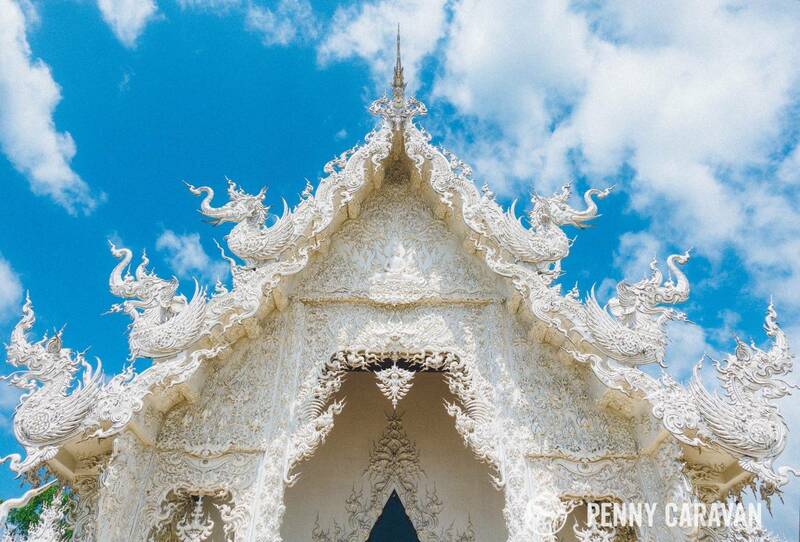 You could also take the bus from platform 7 or 8 at the old bus station to visit the White Temple. 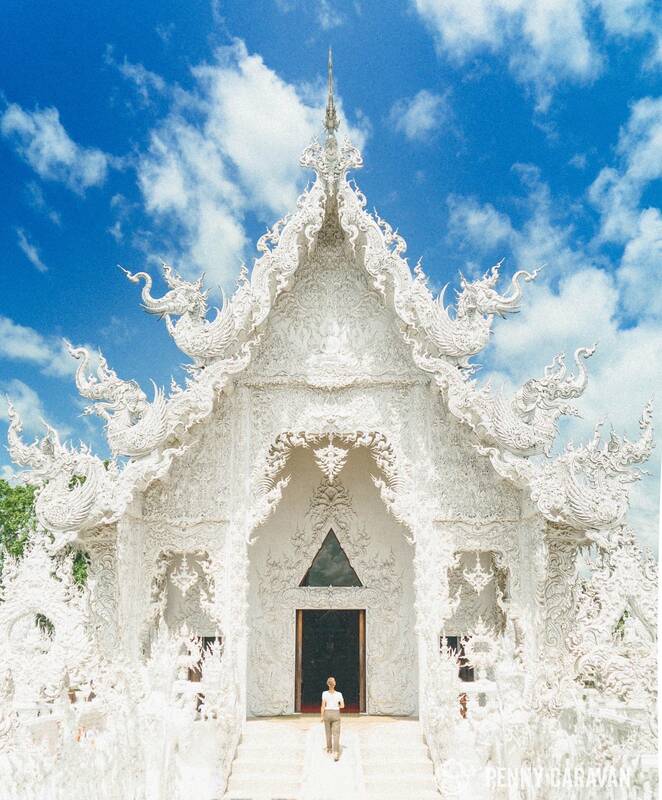 The White Temple is certainly a must-see attraction for many visitors to Thailand. 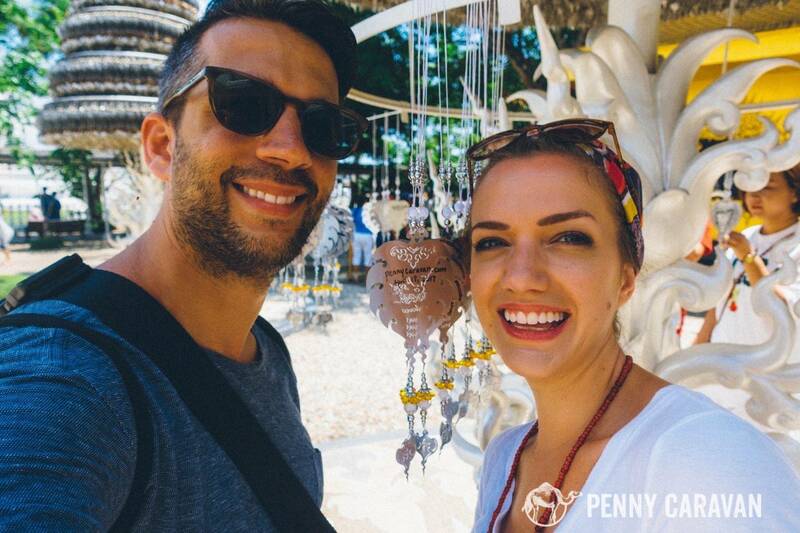 And while you may be surprised to find out that it’s neither old nor a traditional temple, it’s still a unique experience that is well worth the hype. 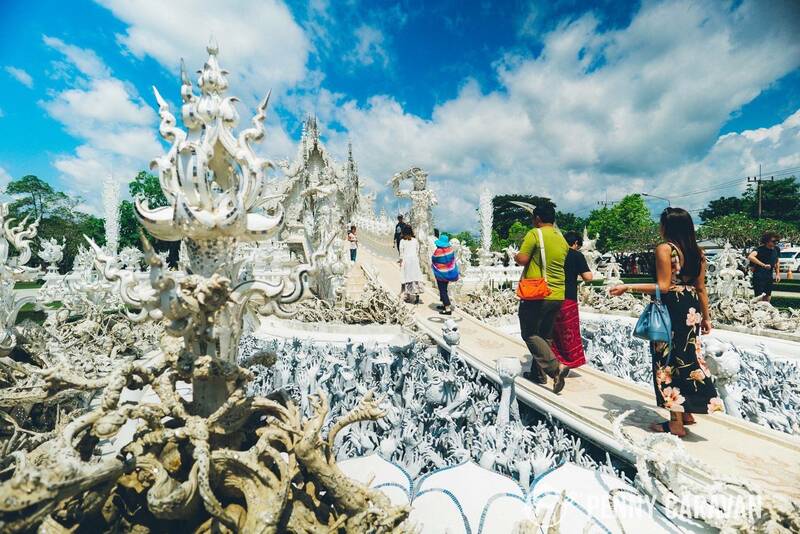 Our recommendation is to get there early and fully immerse yourself in the artist’s vision, letting the experience guide you through the Buddhist teachings to get the most of your experience at Wat Rong Khun.